Pull over to the side of the road-always remember to immediately turn on your emergency signals. Try best to remain on leveled ground and to stay as far away from traffic as possible. If you are not able to pull over to a safe area, off the highway, keep your hazard lights on. Do not get out and try to push your vehicle to the side of the road–that’s dangerous. However, if you feel like it’s unsafe to be in your vehicle, leave your vehicle and move to a safer area. Remember your vehicle’s location-look for a major exit and note any landmarks such as restaurants, gas stations or shopping centers that you are near. In Canton, for example, there is Michigan Avenue south Canton on I-275 and the Ford Road exit. Believe it or not, this information will be useful when calling for assistance. Communicate with police- be sure to communicate your situation to the police. If there was any smoke or steam coming from under the hood or if you heard any unusual noises, let them know. If you have to leave the vehicle, leave a note in your rear window or under a windshield wiper explaining the situation to the police. 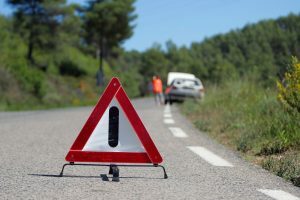 Call for roadside assistance-make sure that you tell the operator your location, a description of your vehicle, the situation and a phone number where they can best reach you at. Also, inform them if you called 911 for the police. Know your rights and responsibilities-if you make the decision to leave your vehicle, exit from the side of your car, facing away from traffic. If possible, bring a flashlight along with you, just in case time rolls over to the evening. If you choose to stay in your vehicle, lock all doors and windows. Do not leave your engine running for an extended amount of time. If you are feeling threatened by a stranger, honk your horn repeatedly, flash your lights uncontrollably and call the police. Once you’ve called for roadside assistance and have your vehicle running (or need it towed), your next move should be to call a local auto repair shop. Mr. Muffler in Westland is only a few miles from 1-275 in Canton. We understand the stress of having a breakdown and strive to make our customers happy. If your car just recently broke down and you are looking for a new mechanic, come on over to Mr. Muffler for any of our auto repair services. Don’t forget to check out our cool specials!